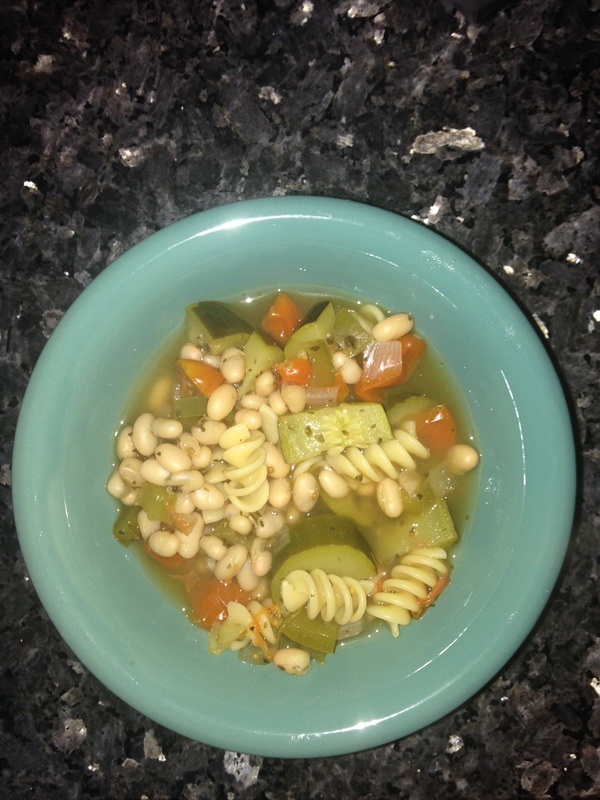 Recipe: Pepper and White Bean Soup With Rotini | I'm Skinny, Now What? In a Dutch oven, bring the broth to a boil over high heat. Stir in the bell pepper and onion stir-fry, zucchini, tomatoes, basil and red pepper flakes. Return to a boil. Reduce the heat and simmer, covered, for 20 minutes. Meanwhile, prepare the pasta using the package directions, omitting the salt and oil. Drain in a colander. Stir the beans into the bell pepper stir-fry mixture. Cook for 5 minutes, or until heated through. Remove from the heat. Stir in the olive oil and salt. Put the pasta into soup bowls. Ladle the soup over the pasta. This is one of my go-t0 recipes. It is so simple, so quick to make and so tasty. If I don’t have the frozen stir fry in the freezer, fresh onions and green pepper work jut fine (and taste better). I also don’t have a dutch oven, so a regular sauce pan does the trick. Spicy food is my thing, so sometimes I can go overboard with the red peeper. And don’t forget the olive oil and salt at the end, unless you have high blood pressure. Those two ingredients at the end really help, though.